A new sight appeared in the baby-blue skies over Southern California: A specially modified 747-400 carrying a 70-foot-long rocket under its wing soared through the air as part of a successful test flight for Virgin Orbit’s LauncherOne. Sir Richard Branson’s small satellite launch company completed a flawless test flight, proving that its carbon-fiber two-stage rocket works perfectly as a pair with Cosmic Girl, the customized former passenger aircraft that serves as the company’s “flying launch pad.” The successful test puts more air under the wings-and fins-of the company’s plans to reach orbit in early 2019. The test, which Virgin Orbit CEO Dan Hart described as “a picture-perfect flight, and a major step forward in our quest to bring a new capability to small satellite launch,” took place in Victorville, California – a test facility close both to Virgin Orbit’s Long Beach factory and to one of its operational launch sites, the Mojave Air and Space Port. The flight lasted 80 minutes in total, during which Virgin Orbit’s flight crew assessed the take-off, landing, and low-speed handling and performance of the integrated system. 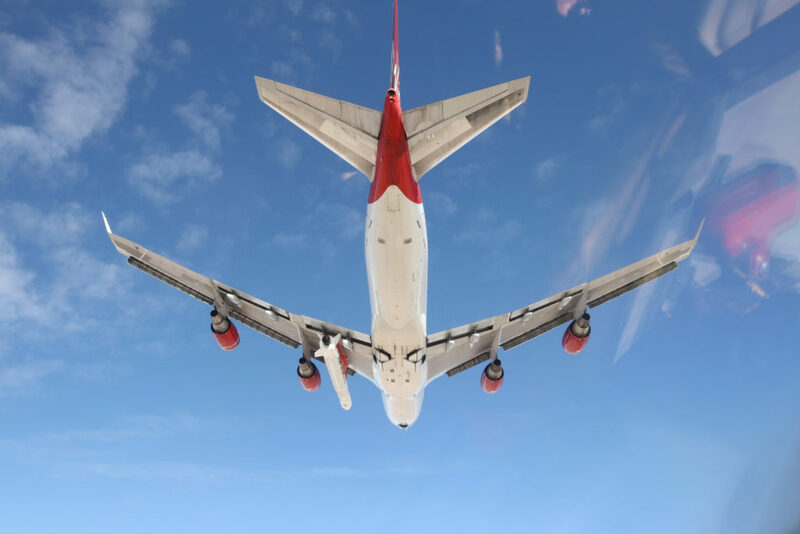 This successful flight marks the start of a new phase in Virgin Orbit’s extensive test flight campaign. As part of that program, the company will conduct several more flights of its 747-400, some with a LauncherOne rocket attached and some without. With mountains of data already collected about the smooth handling of the system, future tests will focus on further proving out the robustness of the company’s modified 747, the carbon-fiber rocket itself, and the performance of the cutting-edge, lightweight avionics and flight computers onboard the rocket. This portion of the extensive testing regime will conclude with a drop test, during which a rocket will be released from Cosmic Girl – without igniting – generating critical data about Cosmic Girl’s and the rocket’s performance as it freefalls through the atmosphere.